GORGEOUS MOUNTAIN HOME! Enjoy Discounted Spring Rates!! Main Level: Kitchen/Dining and Living area are bright and open with vaulted-ceilings, gas fireplace, incredible views and back deck. Lower Level: Master Suite with King Bed, Full Bath with Jetted Tub, Double Vanity, Steam Shower, Fireplace, Large Deck with private Jacuzzi 7-Person Hot Tub; 2nd Bedroom with King Bed and Full Bath. Bottom Level: Bedroom/Cozy Den with Fireplace, Queen Bed and Double Vanity Half-Bath. Home is close to everything... Walk to: Main Street, Free Summit Stage Shuttle to Copper, Breckenridge and Keystone world-class ski resorts three blocks from home, unique shopping and dining, walk to Frisco Bay Marina offering water sport activities, extensive hiking, biking, showshoeing, and crosscountry ski trails. Please note: There is an attached, separate entrance, private owner's lockoff to property ocassionally used by owner. COME ENJOY SUMMER IN THE ROCKIES! Frisco is a charming historical mountain town in the heart of endless fun winter and summer activities. There is no need to ever leave! Just a short walk to Main Street downtown Frisco - Shopping, Bars, Restaurants, Coffee Shops, Book Stores. Bike & Ski Rentals, Ice Cream Shop, etc. Frisco Bay Marina on Lake Dillon is just around the corner from house. Extensive summer lake recreation, festivals and music. Take a fun ride on the bike path around entire Lake Dillon. Peak One - breathtaking view from grand room and decks and front of house. Buffalo Mountain view from back deck and grand room. Laundry room with large washer and dryer on main floor. Free secure WiFi for guests. Beautiful large kitchen, open to grand room, marble counter tops, cherry wood cabinets, gas stove and kitchen bar with stools. Cable network on 48' HD TV with DVD player. Selection of CD music availalble. Selection of DVD movies available. Frisco Bay Marina (within walking distance from home) and Dillon Marina offer rentals. Multiple rental shops within walking distance. Two spacious decks. Upper deck has comfortable chase lounge chair and nce outdoor furniture. Great for cookouts. 7 world-class ski resorts between 10 and 35 minutes from home. Large Jacuzzi 7-person hottub privately located on lower back deck. Look out at snow covered Peak One or under a starry night. Awesome rental in every way! This home was amazing. It was very clean and had every accommodation you could need and more. My teenage kids loved the spacious and private bedrooms (nice having 3 fireplaces; as it was a cold week). The location was blocks from town and we enjoyed our meals and shopping experiences, as well as, many planned outdoor activities. Frisco is truly picture postcard perfect!! Excellent place to stay within summit county. Close to ski resorts, and I-70. Walking distance to downtown Frisco. Would highly recommend. Well cared for! Met our needs! Had stayed here before. the owner lives in the property and that was a bit odd but she was a good hostess! 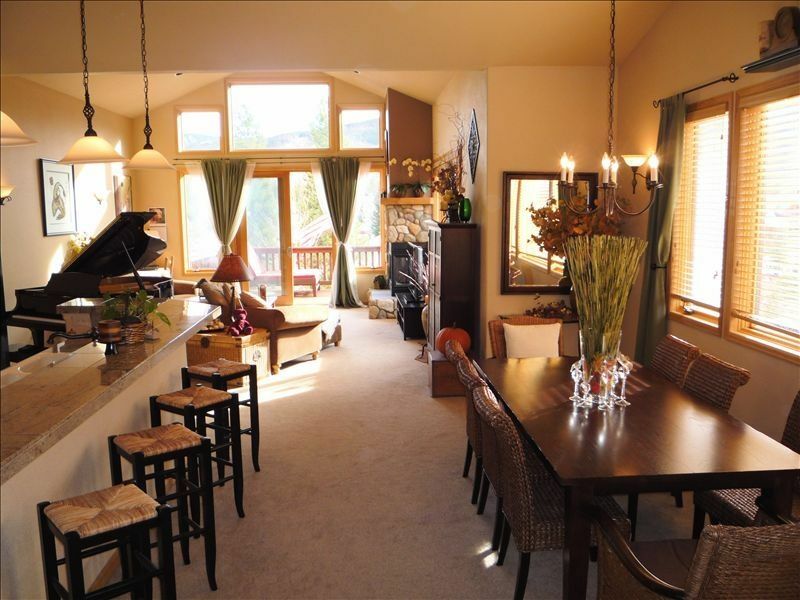 This property is beautiful, well stocked with necessities and close to everything in Frisco.